The attached photo may strike you as a little odd… it did me! 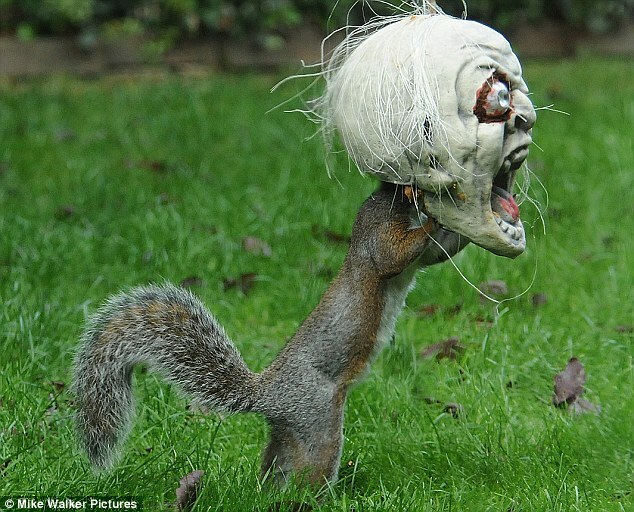 It’s a squirrel in Britain helping himself to someone’s Halloween decorations. I like it for a variety of reasons. The squirrel and I both look ‘normal’ on the outside. On the inside, I feel more like the screaming skull the squirrel is wrestling with. Looking in the mirror, my appearance is pretty much the same as always; but nothing on the inside works as usual. My return-to-work date from this pulmonary embolism is uncertain… when I’m physically ready, I’m told. What about the psychological side, which is beginning to use my frame of mind for ping-pong practice. “They” say this roller coaster ride after a life-changing event is normal. Why does it feel so freaking weird then? I KNOW my thinking’s not right, yet, I can’t seem to change it to my liking. Being an ‘island’ during this recovery slows down my progress. I’d prefer to not need anyone or anything to get back to ‘normal’, but that doesn’t seem to work so well. Last night, The Who’s ‘We Won’t Get Fooled Again’ played on the radio. The bit toward the end when Roger Daltrey lets out that bellowing “YEEAAAHHHHHH!! !”, I thought, “That’s IT, THAT’S how I feel.” For some reason, it’s comforting to put a known marker on a feeling. At least if I can name it, it’s one less unknown scaring the snot out of me. A friend recommended I read ‘The Shack’. My minister, Ryan, had a copy. He always seems to have what I need to read on his bookshelf! It’s kind of funny how the same book can strike various people so differently. The ‘editor’ side of my brain read the first few chapters and thought the writer should have hired a different editor. His writing style is not my cup of tea, still, I’m seeking the spiritual insights it may offer, the message God might be trying to pass along. I’m trying to turn off my inner editor! Actually, that’s probably a hopeful sign when my mind starts editing… maybe I’m feeling a little better, after all!